Since I haven’t received my Blackmagic Pocket Cinema Camera 4K (Amazon, B&H) yet at the time of this writing most of this guide is conjecture – the result of relying on information provided by BMD, educated guesses and my personal experience and analysis based on the work I’ve done with earlier cameras. It is only a starting point, from which you will hopefully continue to research and find what best suits your workflow. The information provided here might not be accurate or relevant. You are solely responsible for your decisions and actions. If you’re looking for cine lenses or manual lenses, read this article. If you’re looking for native lenses for electronic control and autofocus, read this article. Also, don’t forget to read about the important quirks and features of the Blackmagic Pocket Cinema Camera 4K (Amazon, B&H) for video shooters. The C-mount is a mount type (like Micro Four Thirds, EF, PL, etc.) that was popular for Super 16mm film and other CCTV/machine camera systems. They were made for multiple sensor sizes. So we’re effectively talking about using lenses designed for Super 16mm film on the Blackmagic Pocket Cinema Camera 4K (Amazon, B&H) with an adapter. The original pocket camera had a sensor similar to Super16mm film, so you could use those lenses. The new Blackmagic Pocket Cinema Camera 4K (Amazon, B&H) has a larger Micro-Four Third-type sensor, so if you use Super 16mm lenses, it will vignette. Even though the new sensor is slightly wider than Micro Four Thirds, the height is smaller, and the image circle (in bold, in the middle of each box) is similar. Therefore, any lens that works for Micro Four Thirds will work on the new Pocket Cinema Camera 4K. But not Super 16mm lenses, or lenses made for 1/2″ video sensors. There might be exceptions to this, but they will so few and in the higher telephoto range, that it’s pointless to go after them unless you’re really after that. Like I mentioned in my article on cine and manual lenses, there are much cheaper and more robust options out there. Good C-mount lenses are not exactly cheap! Can you use C-mount lenses on the Blackmagic Pocket Cinema Camera 4K? That’s the million-dollar question. Yes, and no. If you want to shoot 4K, then no, unfortunately. You can only use Super 16mm lenses if you’re happy with 1080p. There might be some Super 16mm lenses that cover the sensor (especially if they are made for a 1″ sensor), but these are rare, and are specialty items that are only useful if you already have lenses but are looking for something different. As of this writing there’s no information on what the “window-size” will be for 1080p120, but scaling the sensor as it is right now gives us a guesstimated size of about 8.85mm x 5mm, or an image circle of about 10mm. So any 16mm lenses will work. 1/2″ lenses will also work. Maybe, some 8mm lenses might work as well. But seriously, I don’t get the point of this, when there are cheap full frame or APS-C lenses available that will work great for roughly the same price. They basically screw on to the lens. Try to buy a couple because they are a pain to remove and screw on. Some cheap lenses even come with free adapters. The corners vignette badly when open or sometimes even stopped down. There’s hardly any edge sharpness to speak off. Some lenses, especially zoom lenses, have protruding back elements that are designed for a larger flange focal distance. You will need to shave/saw them off (seriously, why bother?) for it to work. 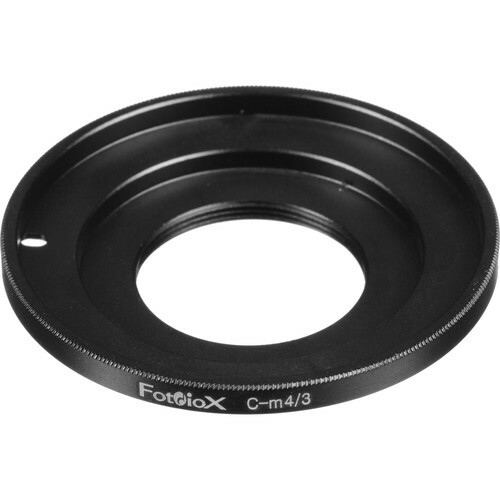 These lenses were made to resolve 16mm film or small video sensors. They were not designed for 4K work. The adapter might be finicky and might not let proper infinity focus. Fujian 25mm f/1.4 (They come in many brand names, Fotasy, Pixco, whatever – they’re all the same thing). But last word, seriously, a Panasonic 25mm f/1.7 lens is only $147 or so. Can you use Super 16mm PL-mount lenses on the Blackmagic Pocket Cinema Camera 4K? The same problems apply though. Since these cine lenses were made for Super 16mm only the medium to telephoto range will completely cover the Micro Four Thirds sensor. For wide angle work you’re out of luck. You can also adapt Bolex Super 16mm lenses. Due to the popularity of the Micro Four Thirds format, and 16mm film shooting in general, the prices of these vintage lenses have shot up in the last few years. If you ask me, they’re not worth it. If you already have these lenses lying around, there’s no harm in trying them. But native Micro Four Thirds lenses have modern designs and are specifically made for the sensor. They will perform adequately well. What would I do if I had a very low budget? 12mm f/2 (Amazon, B&H) (made for APS-C, will easily cover the sensor of the Blackmagic Pocket Cinema Camera 4K (Amazon, B&H). That’s it for lenses! In the next article, I’ll cover post production workflows. Stay tuned. Hmmm not a very accurate article to be frank. Many C-Mount lens will be fine on the BMPCC4K and will be fun to use! You also need to realise that BMD are considering a Super16 crop in a future firmware update for the camera so please do not be dissuaded to use them!